Welcome back to part three of this article series. In part 1 I discussed choosing the right meet for you if you’re fairly new to the sport as well as what to prepare for the day of a meet. Then in part 2, I outlined the thought process involved in choosing the right weight class for you as well as being realistic with your goals for your first few meets. In this part I will provide a synopsis of the running of a Powerlifting meet (i.e. what to expect on the day). 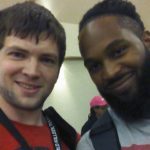 If you’ve never attended a powerlifting meet before then it may be beneficial for me to start by explaining what goes into the organization and running of local and regional meets. Sure, everyone steps up onto a platform with nice colourful weights and lifts heavy, but outside of that, how is it all structured? How do the officials decide who lifts at what time? What is the protocol before you start lifting? What order are the lifts performed in? Here I will outline the typical running of a meet from when everyone arrives up until the whole setup is dismantled and everyone leaves. (Side note: it would without question be in your own interests to read the official rule-book of your federation and any aspects that you’re not sure of contact an official within your federation). This is usually done the day/evening before a competition. 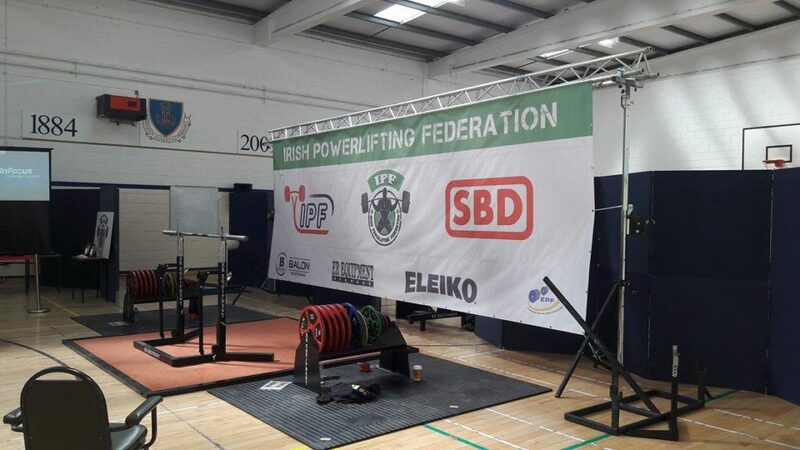 Anyone who hasn’t been involved in the organisation or running of a powerlifting meet really has a very limited appreciation for the amount of work involved in setting up a powerlifting meet. Shout out to anyone involved in helping set-up the platform and plan the logistics for the day. That’s a fair amount of stuff! And it requires a lot of careful organisation and work to ensure everything is provided. 24 hour weigh-in / the day before the meet (note: if you compete in a federation with 24 hour weigh-ins then the Sigma Weight Cutting System could be a great tool for you). The weigh in period is the first step in the meet process. The officials will usually check what items you wish to use during the meet at this stage as well (i.e. belt, deadlift socks, wrist wraps, t-shirt, knee sleeves/wraps etc.) in order to confirm everything you’re using on the day is permitted within that federation. The shorter the time period between the weigh-in and when your first lift takes place, the more important this becomes. If you have a 24 hour weigh-in, you have ample time to eat, digest your food, rehydrate etc. Therefore I will focus more attention on those who have a 2 hour weigh-in. If your weigh in is at 8am and you’re lifting at 10am for example, realistically you have about 30-45 minutes to consume food, 10 minutes to maybe have a quick coffee and then you will need to make your way back to begin your warm up. Unless you have the stomach for it, I highly recommend against stuffing your face at this time. You’ll likely leave yourself with indigestion, bloating and possibly even end up getting sick. Just consume a sensible sized meal, take your time eating it, drink plenty of water and then just snack between lifts if you feel you need it. (Potentially liquid meals containing carbohydrate and maybe some protein may be useful here). How long do I have to warm up? How long do I normally take to warm up? What are the warm up conditions like? 1. How long do I have to warm up? If you’re in the first flight of the day you can start warming up for your squats as early as you wish really. However if you’re not in the first flight then you’re likely constrained to warming-up with the bar (i.e. actually doing warm-up sets of squats, as opposed to stretching/mobility which you can obviously do anywhere) within the time-frame between when the flight ahead of you finishes their warm up and when you’re due to start lifting. 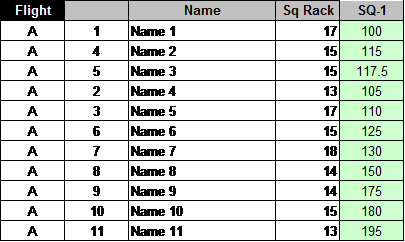 Each flight is sequenced from the lightest to heaviest weight being lifted in that flight (see Figure 1 below as an example). So the person in flight A below with the lowest opening weight (i.e. 100 kg in this example) will lift first, and the person with the heaviest opener (Name 11) with lift last. So the further down the list you are means you have more time to start your warm-up. So for example in figure 1 below lifters 10 and 11 likely have an extra 5-7 minutes (approximately) to begin warming up compared to lifter 1. Bear this in mind before starting your warm up. 2. How long do I normally take to warm up? The “general” warm-up (mobility, moving through range of motion unloaded, “loosening out”, foam rolling, whatever you like doing) should take between 5 to 10 minutes at the absolute most. So from being completely cold up to being ready to go lift you likely need to leave somewhere between 35 and 45 minutes to warm up. One final point to note here: keep an ear out for the announcers. They may announce “5 minutes to start of flight A” unexpectedly to you. So if you were of the opinion you still had 10 minutes, you need to modify your remaining planned warm-up so you leave enough time to be fresh to lift. 3. What are the warm up conditions like? 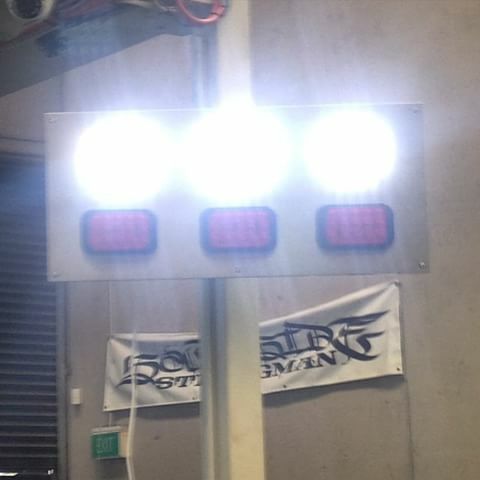 I’ve lifted at meets where there were two competition platforms running simultaneously, yet only three bars available for people to warm up on. This really shouldn’t be allowed to happen but if it does, allow yourself more time for warming up. You may also need to be more economical with your warm up (i.e. fewer warm up sets). Start the warm-up a bit earlier and then you can always slow down as you go. But you can’t go the other way, you’ll just run out of time. 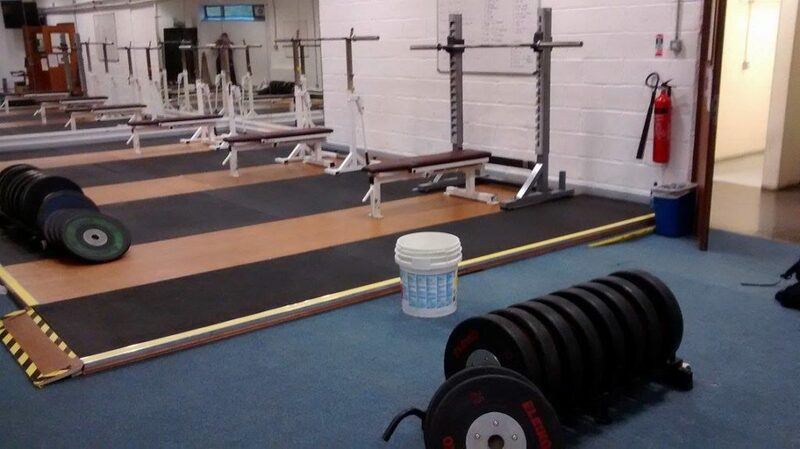 If you’re used to training on your own in a quiet gym, the warm up rooms at powerlifting meets may come as a bit of a shock to you. They are organised chaos a lot of the time. Essentially you have X people warming up for their next lift, sharing whatever bars, plates, racks, benches etc. are available. So it’s every lifter for themselves. You don’t need to be rude about it, but make sure you get fair treatment in the warm-up room. If you’re warming up with 4 others on the same bar, make sure the same sequence is maintained with each warm up set (e.g. if you’re third in line to get the bar make sure the lifters after you don’t try to skip the queue). No one else will look out for you, so look out for yourself. Once the warm up has been completed and you’re ready to lift, double check the order of the lifters in your flight in case there were any last minute changes. Then once it comes to your first attempt, you will see the loaders load the bar to the weight you selected for your opening attempt, lock it into place with the bar collars and then you will hear the command “bar is loaded” from the official. At this stage you are free to step onto the platform to lift. Most federations allow the lifter one minute from the “bar is loaded” announcement until he/she receives the start command for their lift (this may vary between federations so again I encourage you to inquire if you are unsure). Once you complete your first lift, step off the platform and inform the officials what weight you want on the bar for your second attempt. This is the same process between the second attempt and third attempt. Once un-racked, the lifter will walkout into position (or simply stand up if using a monolift) and once stationary with extended knees and hips (some forward lean is usually allowed so long as it’s not deemed excessive) the lifter will receive the “START” command from the head referee. The lifter then performs the squat and stays in their start position until they receive the “RACK” command. Then the lifter re-racks the bar and steps off the platform. The lifter un-racks the bar in their own time (with the assistance off a lift off if requested) and holds the bar stationary with extended elbows. Then once the head judge is ready he/she will give the “START” command, which permits the lifter to lower the bar to their chest. Once the bar is motionless on the chest they will receive the “PRESS” command from the head referee, allowing the lifter to press the bar back up into the locked out position. Once locked out the head referee will give the “RACK” command. At this point the lifter re-racks the bar and steps off the platform. For the deadlift, once the bar is loaded the head referee will raise their hand, this is to signal to the lifter “you may now lift the bar”. Then once it is locked out the lifter will receive the “DOWN” command, allowing them to place (not drop) the bar back down to the floor. Then the lifter steps off the platform. By far the biggest (yet most avoidable) rookie mistake is not listening to the referee and going before their commands. If you go before they tell you to, you’ve automatically failed the lift. So don’t do that! 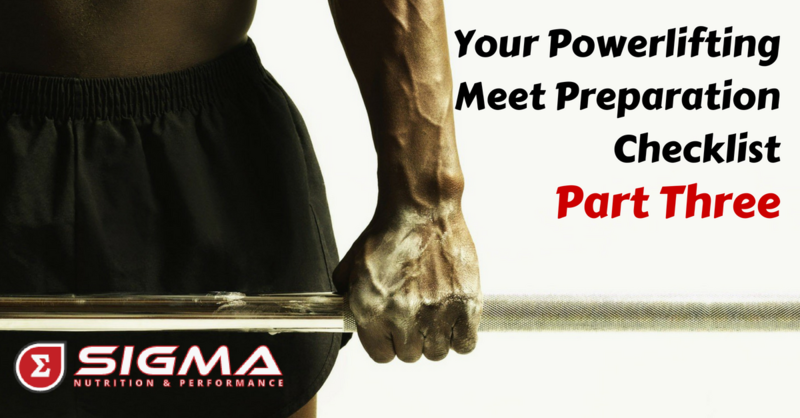 That concludes this 3 part series on preparing for your first powerlifting meet (or your first few meets). Hopefully you found the information in this series useful and as always if you have any questions or comments feel free to contact a member of our team.